GRAND CHUTE, WI - The Wisconsin Timber Rattlers have announced the return of the Sconnie Plan. Fans may purchase ten ticket vouchers for 2019. 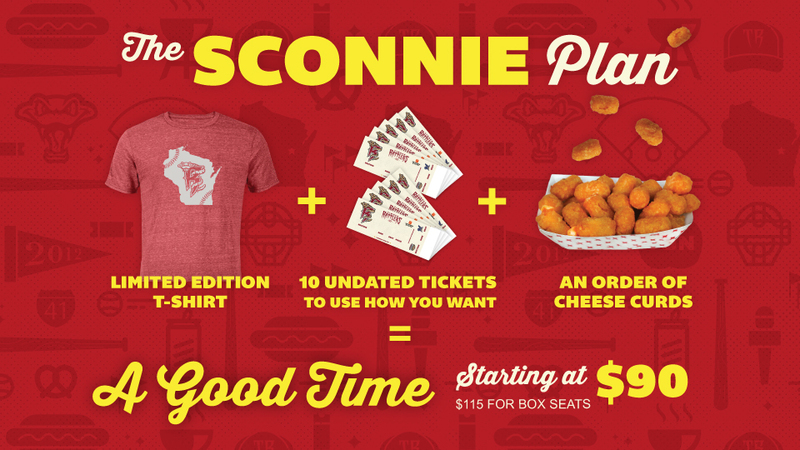 Also included in the Sconnie Plan are a new, limited edition T-shirt and an order of cheese curds. Plans are available now. The vouchers allow fans to select the games - in any combination they wish - to attend next season. If you want to attend ten games throughout the season, you can do that. If you want to bring a friend to five games, you can do that. If you want to bring nine friends to one game, you can do that, too. There are two Sconnie Plans available. The reserved seat option is available for $90 and the box seat option is available for $115. Ticket packages may be ordered from the Timber Rattlers Ticket Office in person, over the phone at (920) 733-4152 or (800) WI-TIMBER, or online. Sconnie plan packages will be shipped on December 17.